I’ve started a fitness plan because of the expanding middle haha. The gym, I attend, is running a course and so I’m tracking what is eaten. The app to track food is called Fitness Pal and is very good for recording what you are eating, drinking and any exercise. I’ve decided to cut out bread, rice, pasta and potato so my diet is on the low carbohydrate side. This is to curb appetite, hopefully. All the obvious stuff, such as sweets, chocolate, biscuits, processed food, etc. are banned. When eating out, may have some of the above although will try to avoid where possible. I’m also trying to cut down on alcohol, which is really hard. Low carb diets are controversial, but recent studies indicate weight loss and improved health. The best way, in my view, is to be sensible. Still eat sweet potatoes, swede, carrots and copious amounts of other healthy green veg. Vegetables such as broccoli, spinach, peppers, tomatoes, avocado, mushrooms are suitable for this sort of plan. When hungry, fruit and nuts are the best snacks, although it is hard if you want chocolate. My dodgy time is around 4pm. By this, I mean it is the time I’m hankering after food. To help with this, lunch is consumed after 1.30pm and even later, if possible. Dinner is around 6.30pm and this does help stop the ol’ hunger pangs a little. Sometimes, fruit and or nuts are consumed in the evening, but not too often. I’m keeping to around 1400 calories a day. This is quite high for me, but feel is sensible and will stop some of the hunger. Will update on my progress and do join in if you want? My plan is at the end of this post. I’ve been sorting out my kitchen cupboards and now see some foodstuff that I’d forgotten about. I know, exciting times! Anyway, I’ve recently discovered and devised a couple of lunch time meals. Admittedly, the first one isn’t low carb, but delicious for a quick lunch. 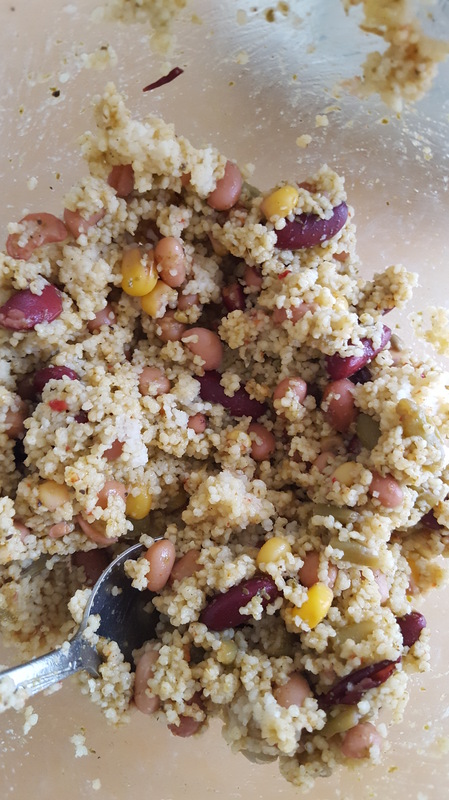 Make cous cous by adding the boiling water and mix. Then add basil green pesto, beans (your choice, I used mixed salad beans). Add a few pine nuts and or pumpkin seeds. Chop up some sundried tomatoes. Add lemon juice, a drizzle of olive oil and mixed herbs. This makes a great lunch which is filling and healthy. Afterwards, you can add what you like such as boiled egg, ham, advocado, etc. Chop carrot, onion and add tomatoes, onion, puree, stock, herbs, garlic, pepper and splash of treacle. Boil and blend, then add the beans. Cook in oven for about an hour in a casserole dish. 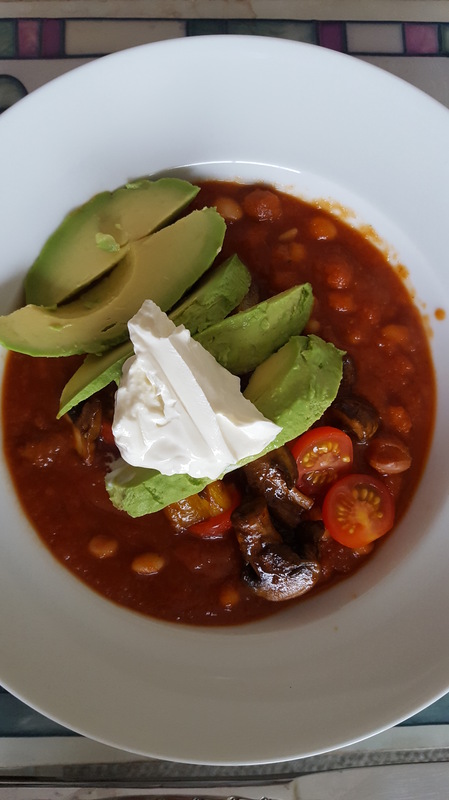 As you can see, I had sliced avocado, roasted mushrooms, cherry tomatoes and low fat cream cheese with the beans and even though I say so myself, the meal was surprisingly delicious and filling. My fitness pal really helped me to lose weight and also to be more aware of what I was putting in my body. The salad looks so good… I need to give it a go! !💖 thanks for sharing! Funny, alcohol was totally easy for me to give up, but don’t take away my carbs! I need them for my running. I do try to stay mostly with whole food carbs, but I still eat brown rice, occasional pasta. For me it’s all in the timing — more carbs on higher activity days, less on lower activity days. The recipes you made look delicious! I too am trying to lose a little around the middle. I’ve given up sugar, and do find that eating less carbs is most helpful. Yes, helps to stop the hunger. It’s a great lunch and you can add other foods too.